These fur booties are great for everyday wear and even better for walks or hikes! Made with your dog's safety and comfort in mind. Fur boots are made with water resistant uppers, durable rubber sole bottom, and Velcro strap and zipper for secure fit! These Faux Fur trim boots are great for everyday wear and were created with your dog's safety and comfort in mind. They make a fashion statement as well as combining functionally. DO NOT RELY ON THE WEIGHT OR BREED ALONE WHEN SELECTING SIZE. 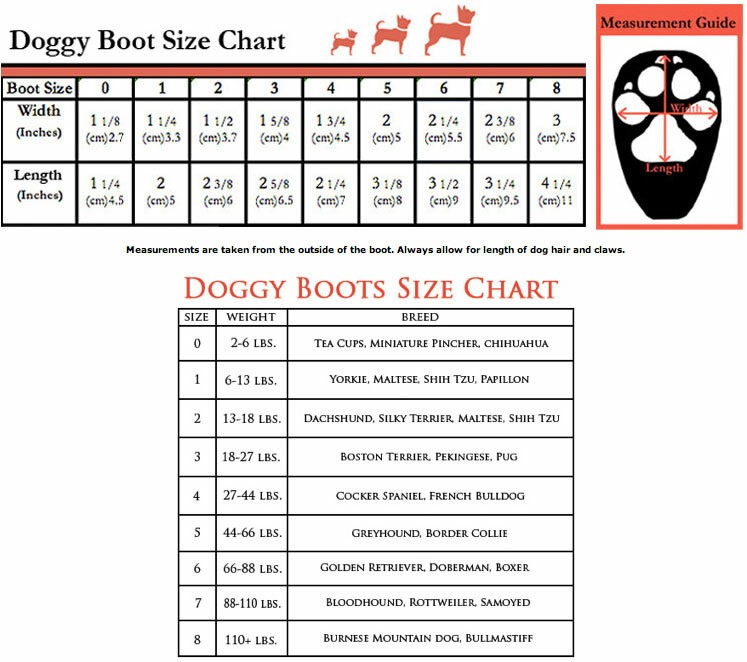 Paw prints on size chart may not be accurate on your monitor and should be printed out. Click the button below to add the Faux Fur Trimmed Dog Boots to your wish list.